Pineapples are sweet and juicy tropical fruits that come with various pluses that can keep you healthy. Americans count this fruit among their favorites, and given the health benefits of pineapple, they’ve every reason to do so. 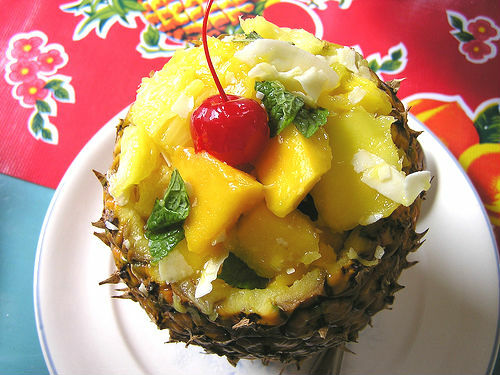 Get the wonderful health benefits of pineapple by adding this delicious fruit to your diet. The benefits of pineapple cater to the overall health-related needs of an individual, aiding in digestion, increasing immunity, decreasing bad cholesterol and blood pressure, and raising energy levels. Here are some prime benefits of this fruit – ones that can convince you to add the pineapple to your diet. Pineapples are a good source of fiber and help in decreasing the levels of cholesterol in the bloodstream, which in turn reduces the risk of heart disease. The American Cancer Society notes that increasing the intake of dietary fiber is responsible for this effect on cholesterol. The Harvard School Of Public Health notes that a diet high in fiber helps in combating metabolic syndrome, which is an ailment that is marked by conditions such as high insulin levels, increased triglycerides, excess stomach fat, and elevated blood pressure. Pineapples are a good source of vitamin C, which is a powerful antioxidant. This vitamin plays a crucial role in the formation of collagen, which is present in the cartilage tissue, muscles, bones, and the blood vessels. Vitamin C also helps in deterring the progression of Urinary Tract Infection (UTI), makes iron absorption easier, and prevents cancer, especially colon, stomach, and esophageal cancer. The U.S. Department Of Health And Human Services notes that half a cup of raw pineapple possesses around 28 mg of Vitamin C, along with just 37 calories. Bromelain is classified as a proteolytic digestive enzyme by the U.S. National Library Of Medicine. When this enzyme is ingested through meals, it helps in metabolizing proteins into amino acids. This enzyme, present in the pineapple and its stem, is very effective in the treatment of ailments such as sinusitis, pancreatic insufficiency, skin rash, and burns. The presence of bromelain in pineapple helps in the digestion of proteins and gives relief from heartburn, eases an upset stomach and reduces its distention. The University of Maryland conducted a research study on animals, in order to determine the effectiveness of bromelain. 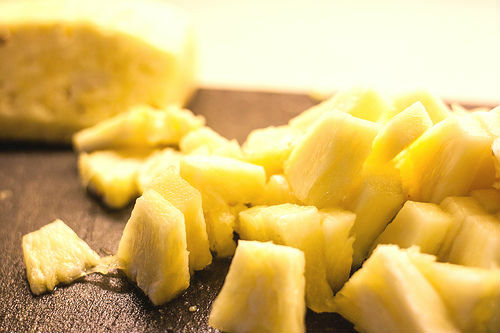 The study concluded that bromelain helps in decreasing the bacteria associated with diarrhea, as it exhibited strong antibacterial activity. Institute Of Medicine (IOM) has clarified that the calories obtained from carbohydrate-rich foods should attribute to around 45-65 percent of your overall calorie intake. Thankfully, you can get a major portion of the recommended carb levels by eating pineapples, as they are an excellent source of carbohydrates and help increase your energy levels. A single cup of raw pineapple provides approximately 22 grams of carbohydrates. Get increased immunity as a benefit of pineapple. Enjoy this fruit in a tasty salad. Experience all these excellent health benefits of pineapple by adding a regular serving of this tasty tropical fruit to your diet. Add it to a fruit salad, drink a glass of pineapple juice, or make a pineapple soufflé – just make sure that you eat pineapples often! This entry was posted in Nutrition and tagged benefit of pineapple, the benefits of pineapple by Zipheal Editorial Staff. Bookmark the permalink.